An authentic Maharashtrian pudachi wadi recipe. 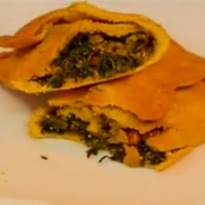 Besan casing stuffed with a onion-coriander filling with poppy seeds and copra. 1.In a pan dry roast poppy seeds and copra for 3-4 minutes. Cool. Grind in a mixie. Keep aside. 2.In a wok add oil. In the heated oil add mustard seeds, zeera, hing and turmeric. Let the seeds splutter. 3.Add the onions. Saute till pink. 4.Add the ginger-garlic paste, green chilli paste, charoli, red chilli powder, dhaniya powder, zeera powder, goda masala. Saute. 5.Add chopped coriander leaves and lemon juice. Saute. 6.Add the copra-poppy seed paste. Mix well. Keep aside. 1.In a bowl add besan, atta, salt, turmeric, zeera powder, dhaniya powder, red chilli powder. Knead with water. This dough need to be stiffer than the regular dough for chapatis. 2.Finish by kneading for 1 minute with a little oil. Your dough is ready. 3.Make flat rounds like you do for chapatis. Apply a little goda masala-oil. Place 2-3 Tbsp of the filling. Seal it from all sides. 5.Cut and serve with chutneys of our choice. Something different but a nice snack to try !